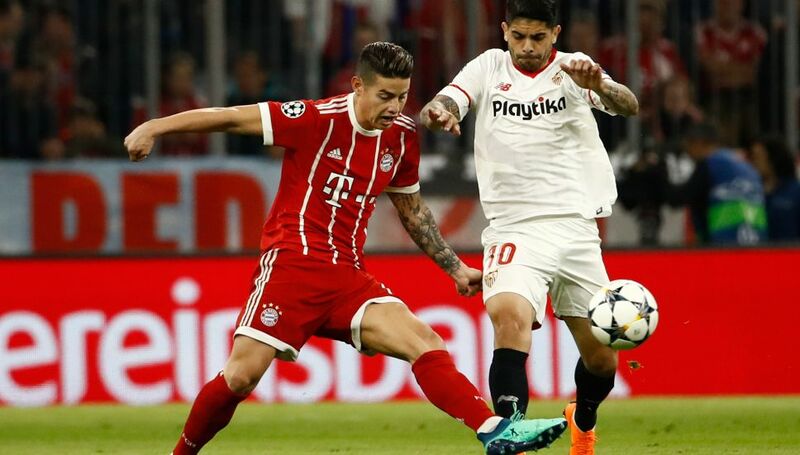 Bayern Munich sealed their place in the UEFA Champions League semi-finals after drawing 0-0 at home to Sevilla in the quarter-final second leg on Wednesday night, giving them a 2-1 aggregate victory. It was a scrappy affair at the Allianz Arena early on, with Sevilla earning two quick yellow cards as they looked to rattle their hosts. The tactics almost proved fruitful as the visitors created more chances, only to lack precision in front of goal. That same misgiving could be applied to Franck Ribery too, as the Frenchman spurned the clearest opportunity of the first 45 minutes when he fired straight at goalkeeper David Soria when well placed to score. The visitors needed two goals without reply to go through but the expected onslaught never arrived as Bayern kept their shape and largely held the Spaniards at bay. The closest Sevilla went to scoring was when Joaquin Correa headed onto the crossbar from a free-kick, while Bayern's most presentable chance fell to Thomas Müller from a Joshua Kimmich cut-back, but his effort was tame. It mattered little in the end, though, as Jupp Heynckes' charges eased into the semi-finals courtesy of their 2-1 victory in the first leg last week. Bayern had 51 per cent possession but completed fewer passes (396) than Sevilla did (410)Bayern collectively covered 70.09 miles; the Iberians 70.46.Ribery, Robert Lewandowski, Kimmich and Jerome Boateng all avoided a booking so have their yellow cards wiped for the semi-finals.The Bavarians' European record against Spanish opposition in Munich now reads: W18 D6 L3.This was Bayern's seventh straight Champions League quarter-final.Bayern sealed a sixth consecutive Bundesliga title on Saturday with five games to spare, beating Augsburg 4-1. Unused Subs: Starke, Bernat, Rudy, Tolisso.